The Animals were a big deal before the "album" as a format really took off. They're probably far better known for their hit singles than for any one album they ever did. It doesn't help that record company meddling back in those days meant that a completely different discography was released in the United States then in their home country of the United Kingdom. So, while people might know "The House of the Rising Sun," they're probably not familiar with any actual album by the band. For better or for worse, I'm listening to most of these artists in album format for this project. I try to avoid "Greatest Hits" CDs when possible, because I want to be exposed to the failures of the groups as much as the successes. But there were many times this week that I was tempted to revert to listening to one of the Animals' many greatest hits albums - not because they have any bad music, but because a lot of their albums were hard to find, even with the magic of the Internet. In the end, I did end up listening to some of their most famous non-album singles. I mean, how can I be expected to do a week of the Animals without listening to "Don't Let Me Be Misunderstood" or "We Gotta Get Out Of This Place"? But their album material was far from the filler or weak cover songs I expected it to be. For what was basically a non-album band, the Animals put out some pretty good stuff. Listening to their eponymous LP, I thought that the famous "House of the Rising Sun" is a pretty stellar opener, and the less famous but still enjoyable "I've Been Around" is an apt closer. The Age of the Album would come into existence just as the Animals were breaking up and going bankrupt. It makes me wish they'd stayed together just a bit longer, to see what they would have done. WHAT I KNEW BEFORE: "House of the Rising Sun," "Don't Let Me Be Misunderstood," and "We Gotta Get Out of This Place" are the three Animals singles I'd heard before, and the three you're most likely to see on a "Best Of" list. 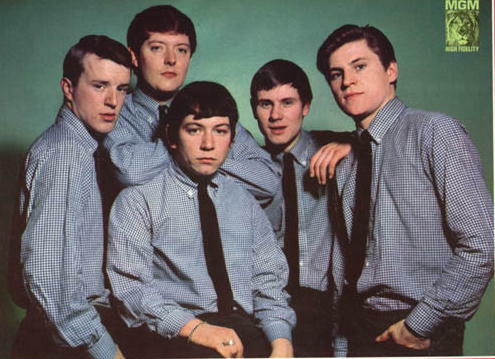 MY LISTENING: I listened to The Animals (1964) every day this week. I also listened to Animalisms (1966) and Animalism (1966) two times each. (Yes, they are completely different albums despite the similar name, the former released in the UK, the latter in the US). I also listened to several non-album singles, like "I'm Crying." WHAT I LIKED: The Animals are almost like an archetype of a rock band - getting in the game early and developing the kind of gritty blues-rock that will be followed by countless imitators. The band knows how to do the blues well, partially because they've got the talent to pull it off. For example, Eric Burdon has a great voice, most famous in "The House of the Rising Sun." But that hit wasn't a one-time thing; the lesser known "Hey Gyp" also culminates in some great blues wailing. The keyboards are just as solid, and support a lot of the songs, despite the fact that they replaced their keyboardist halfway through their brief career. "Don't Let Me Be Misunderstood" starts with a great guitar and organ riff. "Talkin' 'Bout You" is a seven-minute long track - extremely ambitious for the time - the showcases another one of the Animals' best talents - their relentless energy. The song is long enough to give everyone in the band time to show off, but the music just keeps propelling forward with relentless momentum. The song feels like it's only two minutes, even though its three times that length, and it's one of the highpoints of the album. "I'm Crying," one of their first hits, is also similarly energetic. Though it doesn't have the length, it condenses everything great about the band - the great drumming, the blues riffs, the wild singing, the fast pace. Really, the band is right on the cusp of both rock and blues, and its interesting to see them swing back and forth between one and the other. They never quite fully commit to either, but its an interesting point in music history that the two are so closely related; the Animals have the energy of a punk band while still retaining the soulful feeling of the blues. It's quite an accomplishment. Most of the Animals' tunes are pretty solid. If I didn't like anything about this week, it was the fact that the band seems to have found a niche and stuck with it. I can't really blame them for this, especially because the band essentially went through their entire career in about two and a half years. But the band was talented enough that I wish they had had enough time to blossom, possibly mature into something even greater. So I'm hesitant to bring up any specific tracks that I didn't like this week. Instead, I'd just like to point out that their whole body of work is essentially the same thing over and over; which particular songs you like or dislike probably depends on what riffs happen to speak to you. So maybe a "Greatest Hits" album isn't a bad way to go about listening to the band after all. Here's the interesting thing: The original band got back together in 1977 and recorded a reunion album called Before We Were So Rudely Interrupted. And apparently it's pretty good. I wasn't able to track down a copy to listen to, but I'd like to see what sort of music the group made in the seventies. They had a more successful reunion tour in 1983, but their second reunion album, Ark, is apparently not very good. I really like how this builds up to the chorus. Good to know that the youth of 1964 are just as bad at dancing as the youth of today.